Baltimore and D.C. are known for high housing costs, but these 55+ communities buck the trend. 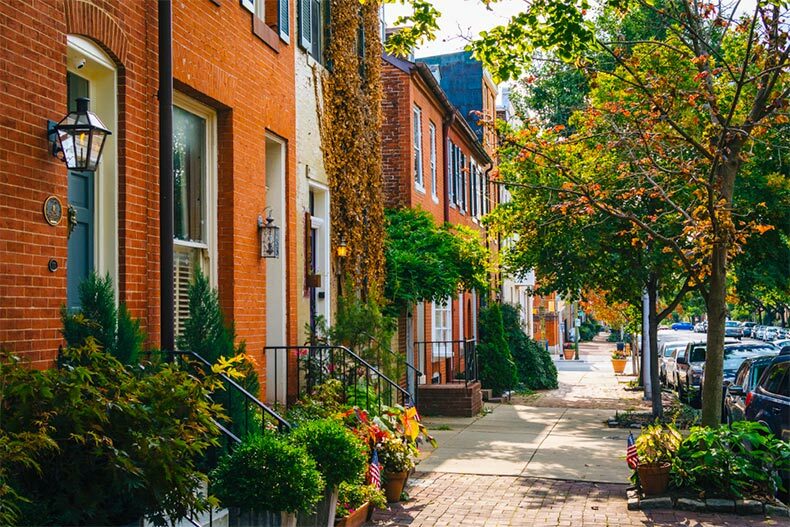 Real estate around Washington, D.C. and Baltimore can be some of the most expensive in the country, but with over 40 active adult communities in the greater metropolitan area, there are plenty of affordable options -- and a lower price doesn’t have to mean fewer amenities. Here are the five best lowest priced communities around Central Maryland. Located in Silver Spring, Leisure World is one of the oldest and most well-known active adult communities in the region. While the gated community has over 5,600 homes, the one-bedroom townhomes are available for resale under $100k and two-bedroom condos are available in the low $200s. Leisure World is truly its own community with a church and chapel, a post office, a bank, and a shopping center right outside the gate. A full-time activities director organizing over 80 different social clubs, a golf course, a fitness center, pools, and tennis and bocce ball courts keep residents busy. For those who want to stay a little closer to Washington, D.C., Cameron Grove in Upper Marlboro is a 55+ community with many affordable options. Located just minutes from the D.C. Beltway and D.C./Maryland line, this community of 750 homes is a great balance of resort-style amenities in an area full of attractions and cultural life. Residents can enjoy staying active at the fitness complex that includes a spa, dance studio, fitness center, tennis courts, pools, or enjoy time socializing with neighbors at the lounge and bar, watching a flick at the movie theater, or playing a game of cards or billiards. The community is also minutes away from the shopping and entertainment district at Largo Town Center, which also offers easy access to the D.C. metro and everything the city has to offer. Located in Annapolis, Heritage Harbour also offers affordable homes in a variety of styles. Homes are currently only for resale, but one- and two-bedroom condos and duplexes are in the low $200s. In downtown Annapolis, residents can enjoy restaurants, museums, the symphony, and events at the Naval Academy, while Washington, D.C. is just half an hour away. On-site amenities include an executive golf course, pools, spa, fitness center, and tennis courts for the sporty; boat slips and walking trails for the outdoorsy; and crafts and woodworking shops for the artsy. While not quite as affordable as some other communities, Gatherings at Quarry Place, located right outside Baltimore in Reisterstown, is an active adult community for those who want to stay close to the city. The new condos have two bedrooms, two bathrooms, and a one-car garage, including luxurious standard features. The homes are energy efficient and easy to maintain, with hardwood floors and modern appliances. The Gatherings at Quarry Place is an intimate community with just over 130 homes but includes amenities like a clubhouse, fitness center, indoor and outdoor pools. But the real appeal is being just minutes away from shopping in Reisterstown and Owings Mills and easy access to the Baltimore metro, Interstate 795, and the Baltimore Beltway. North of Baltimore in Bel Air, the Condominiums at Emerald Hills are easy-to-maintain homes in quiet Harford County. The one- and two-bedroom homes are available for resale and usually range in price from the high $100s to the low $200s. With only 240 homes, the community is small but still offers amenities like an exercise room, outdoor pool and spa, and walking and biking trails. And while the setting around Emerald Hills is scenic, the neighborhood is a few minutes drive from historic downtown Bel Air and the Harford Mall, with easy access to Interstate 95.